Jake Phillips is a 30 year old entrepreneur from the East Coast. A fellow VR enthusiast with a passion for fitness, he has begun a 90-day VR fitness challenge to promote the fitness benefits of VR, and a new fully-immersive treadmill called the Kat Walk Mini. Our interview with Jake discusses the Kat Walk in detail, how it feels and how difficult it is to setup. Jake’s fitness challenge is simple: clock steps, keep his heart rate up, and play the games he loves most in VR while getting fit. Of course, like all of us, his motivations come from a deep seeded passion to live a healthier lifestyle. As we learned with Jake, sometimes VR gaming helps us personify the lifestyle or the escape we want. With our body as controller, we are forced to push ourselves to the limit. Or, as Jake would say: GAME HARD, GET FIT! VRFI: Let’s begin with the basics: Who are you and how did you get into VR Fitness? What’s your headset and your favorite game to play? Jake Phillips: I have always had a passion for both fitness and gaming throughout my life. When I was young I played ALL sports… you name it, I played it. As I got older (around 8th grade), I learned that football was the best sport for me. As far as I know, I still hold the South Carolina State Championship time for the Pro Agility Run. Going into college, I did not pursue my football career. I was not quite big enough for the collegiate level, and I felt I didn’t want to waste my college career riding the bench and being a tackling dummy. I decided to enjoy my time in college, and made up for the absence of fitness with signing up for my first Triathlon. I trained for 6 months, and walked away with a 2nd place medal for my age group. I continued to run in 5K and 10K runs for fun, but never took it more seriously to go for the marathons. Instead, I got more involved with my original passion for fitness… Weight Lifting… I was in the gym almost every day with a friend working hard, and love it! Eventually, life happened… Career, Marriage, and Life in general started taking precedence and my fitness routine suffered. The further I got out of it, the harder it was to get back into the swing of things. I watched my belly get bigger, and my clothes get tighter, knowing how desperately I want to be back in the shape I used to be in. Finding an hour a day for the gym always fell to the side. Jake from a few years ago. Motivation for the challenge: get back to this shape again! Given my love for VR and gaming. I started really paying attention to the health benefits of incorporating a Virtual Reality HMD at home into a fitness routine, where you can just have fun while getting in some exercise. I’ve been a big fan of games such as “Thrill of the Fight,” “Beatsaber,” “BoxVR,” and others. I use a VIVE PRO and you will find me most often playing War Dust and Skyrim. VRFI: You mentioned that your routine began with the idea that you could definitely clear one hour a day to play video games. What would you tell people out there who tried and hit the plateau? Jake Phillips: I think the biggest thing that holds people back from getting to the gym is the feeling of obligation to HAVE to go get my workout in and it becomes a chore…. I think it’s simple… play things that you enjoy…. Try to see this as time to go have some fun… Don’t pick games just because they have more movement involved.. play what you love… Just being on the treadmill will get you your daily steps. Of course you can have various days where you push for more intense games and “rest days’ that you just play what peaks your interest. I genuinely feel that the biggest problem for the challenge I’m doing is limiting myself to only 1 hour…. I find 1 hour of gaming ends quickly… many play games for hours on end.. especially when it’s a game that they enjoy, and not a cheap 10-15 minute experience made for the treadmill. I will only do 1 hour to get accurate findings. VRFI: You’re doing a 90-day fitness challenge, and you’re streaming it live. What’s your streaming setup like? What can viewers expect when they tune in? Jake Phillips: My live stream will take place in my home office in Bayonne, NJ. I have 4 camera’s rigged up with different transitions. Every Sunday… Once streaming starts, It will be a broad view of my space where I will address the viewers and say what’s on my mind…. I then will move to a 2nd scene were have 1 camera directly on the scale, and another against the wall.. I can show weight and body images in real time…. After this scene, I will switch scenes to my whiteboard, where we will document my findings, and view measurements, current results….. Then the next scene will be the gaming… It will transition to a Game Capture, with me in the corner. This way they can see and hear what I’m seeing and hearing as well. I’ve cut the audio in the room so they don’t have to hear me working out and breathing heavy. I have a mic on my Vive Pro headset that I will turn on periodically to speak to viewers. After I’m done, I switch to the ending scene where the camera and mic will go live on me and I can address the viewers and say goodbye. I will also be showing results on my fitbit for steps I got during each session. On non weigh-in days (Mon-Sat) I will skip the weigh in and whiteboard portion… address viewers, say a few things about what I’m playing and how I’m feeling, and go straight to gaming. VRFI: When did you first find out about the Kat Walk Mini? Jake Phillips: I was actually in a China on a business trip and stumbled across the Kat Walk Mini’s being used at a local arcade for a 5v5 tournament. I was amazed at what I was seeing, as I didn’t even realize something like this existed. Once trying the “Kat Walk Mini” VR Treadmill, I realized that this thing had some real potential to take VR Fitness to that next level. This was a true cardio machine. I saw this as a way to reinspire my motivation to exercise. An exciting solution that will actually make me want to do my daily workout. It turns out they simply didn’t have great distributors here yet….. This is when I saw a real opportunity to sign on with them and help spread this thing throughout the US. I realized that this could be a great solution to try and get my workouts in. I may never find an hour to drag myself to the gym, but I bet I can find an hour to play games!! For me this is where fitness and gaming truly intersect. If this idea is successful, it could literally reshape our youth. I am passionate that we really have something here and that is is the perfect recipe for something great. VRFI: What are your thoughts on the current state of locomotion in VR? Aside from the Kat Walk, who is doing locomotion right? Jake Phillips: Current locomotion has come a long way…. They are not perfect by any means, but I believe a huge step in the right direction. The fact that you can now move your feet and have a VR system track that movement in game, with no sensors needed, is amazing! It is important to support the movement for any VR company pushing for full immersion and taking gaming to the next level. If it’s something you believe in, you must support the process of getting it there. Otherwise, companies can’t afford to stay in business, and their dreams die with their company. I am a huge VR enthusiast and see how incredible this ability is. Though they still have room for improvement, it is very much a functional product offering a great experience. I think users understand this is not a natural footstep as if you were walking around. Though that is the goal, we are not quite there. The only company I am aware of with a finished product like this, is Infinadeck, and they are charging in the range of $40,000 with not really any content. They are obviously only geared towards industries such as Healthcare and DoD applications. For our machine, the walking is a bit different. With sneakers or socks your motion will be a bit more of a slide or shuffle. It is a little awkward at first, but it’s like riding a bike, once you got it….. you got it! It then becomes a very natural feeling and becomes a learned motion that feels normal. When I am in a VR headset, the motion to walk for me is seamless and totally makes sense in my own mind. The motion feels totally normal and tricks my brain into feeling as if this is just the way to walk in my VR world. A more natural footstep motion can be achieved with special shoes, but this takes practice and a bigger learning curve. Many people opt to just use their normal sneakers or socks because they feel more comfortable having the stability and sure-footedness. The shoes create a slippery feel that makes you feel as if you are walking on ice. It takes some getting used to. With that being said, it is totally achievable for the serious gamer. 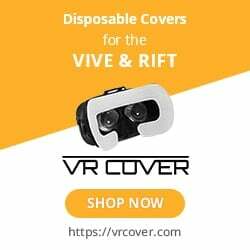 Twisted Reality AR/VR is actually in the middle of making a brand new shoe cover that will enhance your walking experience. We are expecting our first working prototype by the end of this month. VRFI: So the Kat Walk, in your mind is a lot like a replacement for an exercise bike. What are some of your favorite ways to use yours? Jake Phillips: My favorite is being dropped into battle in War Dust… 32v32 absolute mayhem… this redefines the term “Run & Gun.” You have a fast respawn, so you are continuously going.. running to or from enemies.. They have ATV’s, Dirt Bikes, Fighter Planes, Boats, Helicopters, Tanks, everything! I think it’s so cool that I can hop on an ATV, physically sit down to ride around, and when I see an enemy hop up, aim, and attack. The fact that I am in the middle of a war situation, your adrenaline is going, and you completely forget about being tired…. The fun overtakes the feeling of exercise.. You’re not sitting on a stationary unit, staring at the timer waiting to hit your allotted cardio time. Also, I love exploring the lands of Skyrim… questing through their 100+ hrs of amazing content… fighting dragons and having sword fights. This game is especially responsive with the treadmill. Given that I am trying to get a workout, I like to take longer routes, “camp” less in battle games and run out on foot (risky). I also tighten my abs tight while making my turns and movements, putting some muscle behind swinging my sword, and not being afraid to try to dodge swings by cradling much like a boxer does when they have their guard up. Hands up, abs tight, side to side motions. VRFI: Are there Kat Walk specific games, or does the system function with every VR release that allows for free locomotion? Another way to ask this question, does Kat Walk output as digital movement (IE the trackpads on a Vive Wand)? Jake Phillips: Kat VR has currently made 16 games.. of that 16, I only personally enjoy about 6 of them… With that being said, only 2 of them I play regularly… Bullet Sorrow, and Lop Nur Zombie… They also have a game VR Battleground, but that is exclusive for the Chinese market…. The good thing is that they are compatible with basically every game that has a locomotion setting. They are able to integrate the games and have the treadmill basically read as a giant touchpad. I am even speaking with a developer now about trying to create a game where when you strap into the Kat Walk Mini, you are loading into a Mech Warrior like the Jaegers in Pacific Rim. So that when you are running around, you are controlling this robot basically. VRFI: So what does a home setup look like? How tough is it to implement? Is the base weighted, and how much space should one clear for a pad? Are we looking at the centerpiece for tomorrow’s VR room? The unit is slightly over 4’ in diameter, and can fit in pretty small spaces. I put mine in my home office. Also, with only 2 set screws to remove from each rod, it can easily be broken down and slid under the bed. With that being said, it certainly is cool to look at and makes for a great conversation starter as your centerpiece… some people want to show it proudly! This can be installed rather quickly. The user must than download the KAT IO app online, download the STEAM VR driver, and they are good to go! Games must be run through the KAT IO app so that it reads the treadmill. The only other variable is finding a way to run the wire for the VR Headset from the PC to the unit (where you will be wearing it). We offer floor stands that will organize the cord and hold over your head.. This is ideal for many. I personally use a pulley system to run the cord up the wall and over my head. With the rapidly evolving demand for wireless headsets, I believe this will be an issue that goes away quickly. Since our unit simply works with Steam VR…. As long as the headset can run through Steam VR, it will work on the Kat Mini. VRFI: What’s your dream for the Kat Walk? Will we see this treadmill dominating eSports? Jake Phillips: Though KAT VR as a company has not started an official push in eSports… I myself am in the process of getting together a “vSports” league. Since I am a distributor, I have relationships with numerous arcades throughout the US. I am getting everyone together to try and start some events where we can encourage competitive play, leagues, etc. I believe you will see these machines making waves in the industry in the coming years. VRFI: What do you see as the VR advantage in fitness? Your mantra is Game Hard Get Fit! How does VR help you live those words? Jake Phillips: I have always been a fan of Call of Duty games where you can be a soldier and go into battle. By having the fully immersive feel of both VR + Treadmill… now I can become the soldier! I think it’s so cool to be dropped into a battlefield and be the soldier running and gunning. You are now not just a gamer, you are a soldier! From Gamer To Soldier! The fact that you can play something you love and get in shape means that the more you have fun, the better the results will be on the scale… to me this is amazing! The next generation of gamers could be athletes! This could help be a potential solution for kids to fight childhood obesity… Get off the couch, and IN the game!